Keeping your camera's battery fully charged is one of the keys to avoiding many common camera problems. However, what should you do if your camera's battery charger or AC adapter is causing problems? Troubleshooting a camera battery charger isn't as difficult as it sounds, especially with the tips listed below. However, it is important that you try to fix this problem as quickly as possible. Any issues with electricity, batteries, and malfunctioning battery chargers or broken AC adapters could lead to a short or a fire. Shy of those issues, it could cause a surge in power to hit your camera, shorting out the electronics. Before you throw away the battery charger, though, you can try to fix it safely. Use these tips to give yourself a better chance for troubleshooting battery chargers or AC adapters for your camera. So how do you know if you have a camera battery charger or AC adapter that is malfunctioning? If your battery just isn't charging correctly, it could indicate a problem with the charger, although it's more likely that the battery needs troubleshooting. If the problem lies with the charger, you might smell an odor of burning plastic when the unit is plugged in, or you may see a physical problem with the unit. Keep in mind that the first time you use the charger, it may have a bit of an odd smell, but it should dissipate quickly and should not be repeated in further uses of the charger. You also may notice a malfunctioning battery charger if the indicator lamps on the unit seem to be behaving oddly. Check your camera user guide for information on how the indicator lamps should behave for various functions, including the color of the lamps and whether they flash or remain solidly lit. If you have a malfunctioning battery charger, unplug it from the wall immediately. 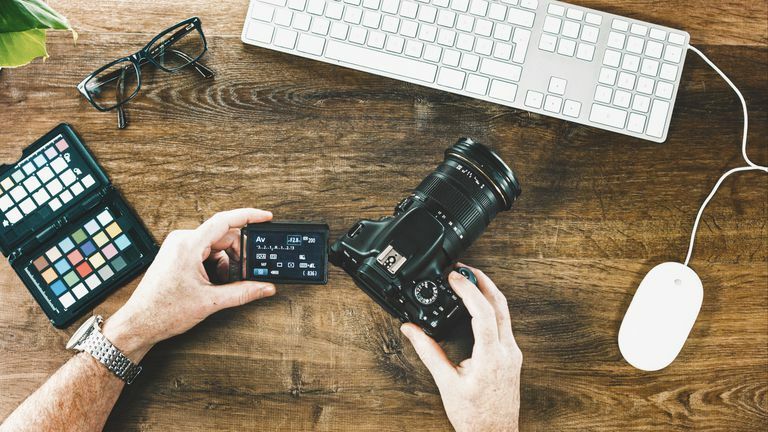 Don't try to charge the battery or plug into the camera if you suspect that the battery charger or AC adapter for your camera may be malfunctioning. It just isn't worth the risk. Before trying any troubleshooting techniques, look closely at the physical condition of the unit. Make sure the cables have no cracks or punctures in them, allowing you to see the metal wiring inside. Check the metal contacts for any grime or any scratches. Deep scratches in the hard plastic parts could be dangerous, too. Do not use a charger or AC adapter that shows any damage, either to the pack or to the power cable. Such damage could lead to a fire. Camera battery chargers typically are designed for a certain type of battery or battery pack. You do not want to try to charge a battery in your charger that isn't specifically approved to work with that charger, or you run the risk of starting a fire or shorting out the battery. Most battery chargers use a series of lights or lamps to give you information on the status of the battery's charge level. With most cameras, an amber, yellow, or red light indicates a battery that's currently charging. A blue or green light usually means the battery is charged. A blinking light sometimes indicates a charging error; other times, it indicates a battery that is still charging. Check the user manual to learn the various light codes. Some batteries can be damaged or can lose their ability to hold a 100% charge if the charging process is interrupted before the battery is fully charged, so you don't want to misinterpret a light code and stop the charging process early. If you cannot make the battery charge correctly immediately after using the battery in your camera, the battery's temperature might be too high for the charger to operate. Let the battery cool down before trying to charge it. Some battery chargers include a USB port for connecting a USB cable to plug into an adapter. Others have electrical prongs that snap into the USB port so it can plug directly into the wall. Make sure you understand exactly how your battery charger works so you can use it safely. One way to potentially lengthen the lifespan of your camera's battery charger and the battery is to not leave the charger plugged in all of the time. Only plug it into an outlet when you're using it. Even when the unit isn't charging a battery, it is drawing a little bit of power, and this continuous power draw could shorten its lifespan, as well as the lifespan of the battery. Unplug the unit once the battery is charged. What Does 'Automatic Mode' Do on Your Digital Camera? How Long Do Camcorder Batteries Last?